The famous 1715 Treasure Fleet has been long sought after by treasure hunters hoping to recover its considerable cargo. 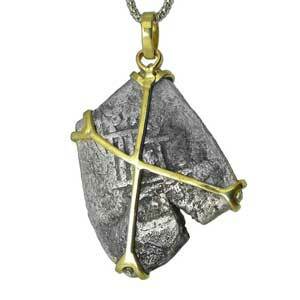 Now, Ferbers is proud to offer some of the rare, exotic items from the growing collection of this historic shipwreck. On July 24, 1715, a convoy of twelve ships full of gold, silver, and precious jewels departed the Havana Harbor to set sail for Spain. King Philip V desperately needed this fleet to arrive safely for it was the final attempt of importing some of the riches from the new found land to support Spain’s soon to be bankrupt economy. Less than a week after this fleet’s departure, all but one of the ships were destroyed by a violent hurricane that spread across the coast of Florida, resulting in over a thousand casualties and untold lost treasures. Among these treasures is an estimated 550 million dollars of gold and silver coins that were left behind after the Spaniards abandoned their salvage operations. Due to the fact that there were no official manifest documents, the amount and variety of jewelry aboard the ship remains a mystery. However, it is believed Philip V had over 62 chests of exotic jewels on board, many of which were to be included in the Duchess of Parma’s dowry as she awaited marriage with Philip V. Modern salvage operations started by Kip Wagner in the late 1950’s, were taken over by Mel Fisher, and then finally Queens Jewels in 2010. To this day, vast treasures and unique jewels are being discovered.